Procrastination and tips to do things today! SO, do I need to tell you the definition of procrastination? I’ll tell it to you tomorrow. See? That’s what we do most of the time. We put off everything for tomorrow. Even after realising the demerits of procrastination, we never work towards prohibiting it. It’s not a sin actually, but it’s a wrong thing, a very wrong thing. It’s of course a human tendency, but it’s not good. Even I’ve been to the blame too. Let’s get started! That’s the bitter reality, people. Often, things go unnoticed right before our eyes, even while we’re fully awake. ‘Later’ – the deadliest word. Don’t you wish, you could go back in time to propose the girl you loved, that day itself? But now she’s gone, isn’t she? Don’t you wish you could go back to your golden childhood days and study a few more lessons in history? But now you aren’t the company’s CEO, right? I know you would wish for that. Everyone repents at not having done the thing that day itself! But, Is there still any hope? Yep, there is! And a big one indeed! 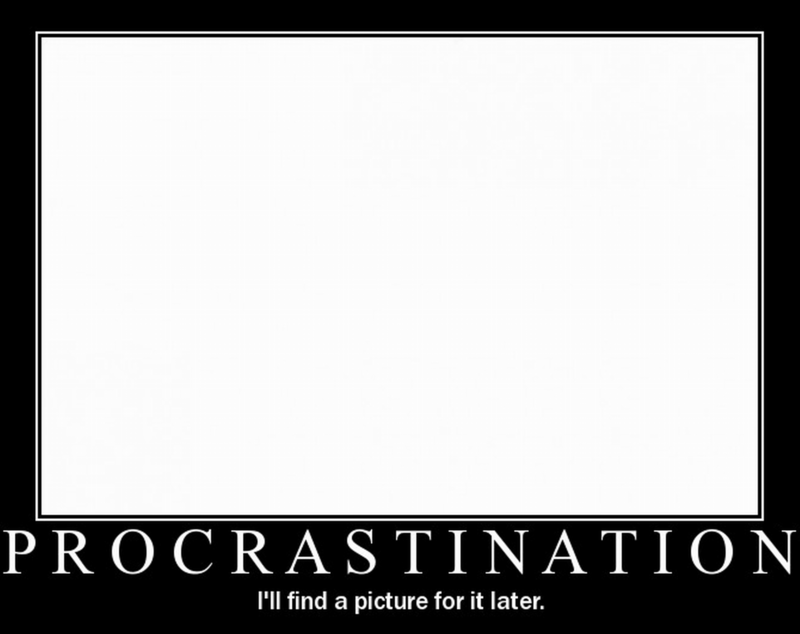 Often, procrastination becomes a boon for many. There are examples of various people who used to procrastinate and now are leading a healthy life. Why? There’s a simple explanation to this ‘why’ – because they wanted to. Procrastination is a great teacher too, guys. When people realise that it’s too late now, many stand up and look for other options. And many just let more of the time to pass. When a door shuts upon you, many others open! Yes, every cloud has a silver lining. Go to your bedroom or any other room! Look into the eyes of your image. Ask yourself – Is it too late? Reply yourself – It’s never to late. Come out of your room, and get out of your comfy. Go out and explore the world. There must be some place or the other, which would employ you happily. Work hard and reach your goal. And remember, never put off anything for tomorrow. Procrastination truly damages your personal life too. Didn’t your wife/husband ask you to go for a candlelight dinner? What reply did you give to her/him? Maybe a “tomorrow”? Stop saying that people, and live your life. A happy life isn’t just money, it’s more about love, relationships and nature! So, people, I would advice you to plan your schedule beforehand and start working towards making a better world for your beloved, children or other people close to you. One more advice to the youth – Do you homework today itself, yes! I mean it!. This entry was posted in Bad Habits, Self Control and tagged Procrastination. Bookmark the permalink. ← Getting bullied? This is what you should do.